Christian H. Passow – chp@creare.com Creare Inc.
162nd ASA Meeting, San Diego, Calif.
Workers operating in extreme noise need more than earplugs and earmuffs to protect their hearing. Navy crews launching jets from aircraft carriers work in noise levels approaching 150 decibels (dB). Sound at this level causes instant damage to an unprotected ear, while crewmembers correctly fitted with both earplugs and earmuffs can still exceed their recommended maximum noise dose during a single aircraft launch. This is because the protection provided by earplugs and earmuffs is limited by sound transmission paths that bypass the ear canal. Think of a dam blocking a river. When the water level rises above the river bank, the water will flow around the dam. The maximum amount of water that can be held back by the dam is not only limited by the height of the dam, it is also limited by the height of the riverbank. Similarly, the maximum attenuation (sound reduction) that can be achieved by blocking the ears is limited by sound travelling around the blockage, which can occur when sound travels through the skull to reach the inner ear. This is known as the bone-conduction limit. An acoustically-sealed helmet is needed to shield the head to overcome this limit. 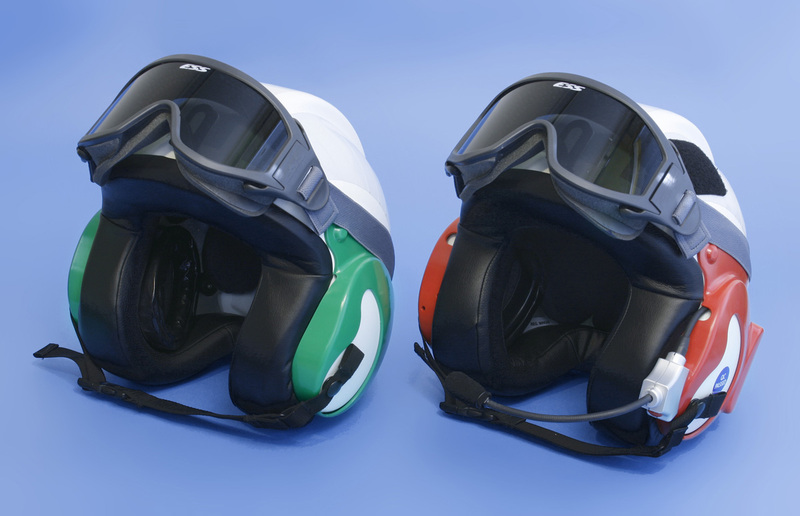 With the protection provided by a specially-designed helmet containing earmuffs and worn with earplugs, workers can extend the time in which they can safely operate in extreme noise levels. The development of a helmet that provides hearing protection beyond the bone-conduction limit is described in this presentation. The helmet, shown in Figure 1, was designed for the extreme noise levels encountered by Navy aircraft carrier deck crews. Key features include a lightweight shell, an acoustic edge seal, and high-volume earcups. The design was based on extensive performance measurements with human subjects and with a head simulator that correctly modeled the anatomy of a human head. Use of a head simulator was crucial to the successful development of this helmet. The variability in measurements made with human subjects means that results from a large number of subjects must be averaged to determine the performance of a particular configuration. Tests with large subject populations are expensive and are typically only used to characterize the performance of a final design. Tests with smaller subject populations are unreliable as subject-to-subject and test-to-test variability can mask real performance differences. Test fixtures like artificial heads may be used to make the accurate and repeatable performance measurements needed to optimize a design. However, most test fixtures only capture the external geometry of the head, not the internal anatomy. The degree to which a hearing protection device can protect against bone-conduction transmission paths cannot be measured with these fixtures. In order to design a helmet that goes beyond the bone-conduction limit, we developed an anatomically accurate head simulator that included simulated skull bones, internal organs, and skin tissue. The simulator was instrumented with microphones to measure sound in the ear canals, accelerometers to measure motion of the temporal bones in the skull, and a hydrophone to measure sound pressure in the skull cavity. A photograph of helmet testing with the head simulator is shown in Figure 2. Measurements made with the head simulator revealed the extent to which the head must be covered to provide effective shielding. An important finding was that effective protection could be obtained without fully enclosing the face region. While a fully enclosed head would be better protected, the sound reduction provided by a helmet that leaves the face uncovered is sufficient to defeat the bone-conduction limit and extend safe exposure times in extreme noise. Measurements with the head simulator also demonstrated the importance of a helmet edge seal that provides a close fit and acoustic seal between the helmet shell and the wearer’s head. This thick elastic seal also helps stabilize the helmet on the head, providing a good platform for night vision goggles. A negative consequence of the edge seal is that it prevents any cooling airflow over the head, which can make the helmet uncomfortably hot to wear. However, the effect on the body’s core temperature is limited because only the head is covered, and core temperature measurements from human subjects in a hot environment showed that the helmet did not affect core temperature more than the current helmet worn by deck crews. A final finding was the importance of integrating large volume earcups with edge seals that create an acoustic seal about the wearer’s ears. 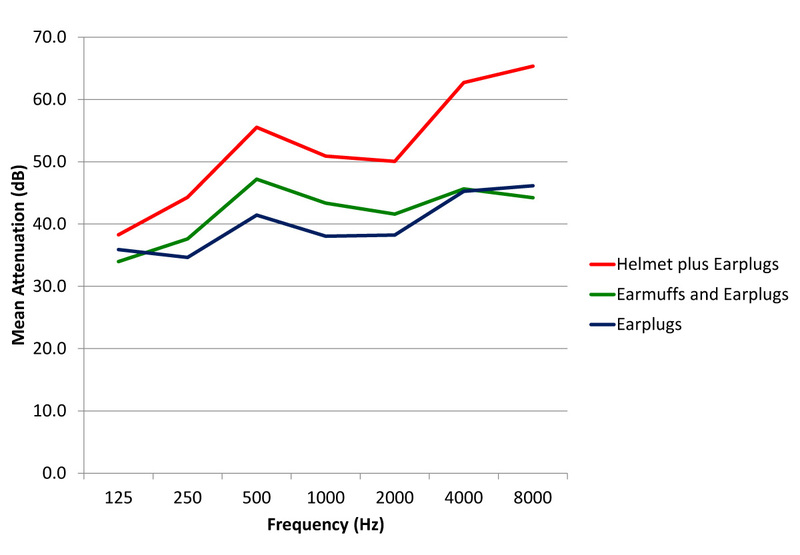 The sound reduction performance of the final helmet design was measured using a standard technique at an accredited laboratory with a test population of twenty human subjects. The results are shown in Figure 3, where mean attenuation (sound reduction) is plotted against frequency. Results are shown for earplugs, earplugs and earmuffs, and earplugs and the helmet. Earplugs reduce the sound by nearly 40 dB. Someone working in 150 dB noise with this level of protection will reach their recommended exposure limit in one and a half minutes. This is just enough time to launch a single aircraft. Wearing earmuffs as well as earplugs adds another 3 dB of sound reduction, doubling the wearer’s allowable exposure time to 3 minutes. The bone conduction limit has been reached. The helmet overcomes this limit by shielding the wearer’s head and reduces the sound by more than 50 dB over much of the frequency range. The result is that the wearer’s recommended exposure limit is increased to 15 minutes – a fivefold increase over the earplug and earmuff combination. 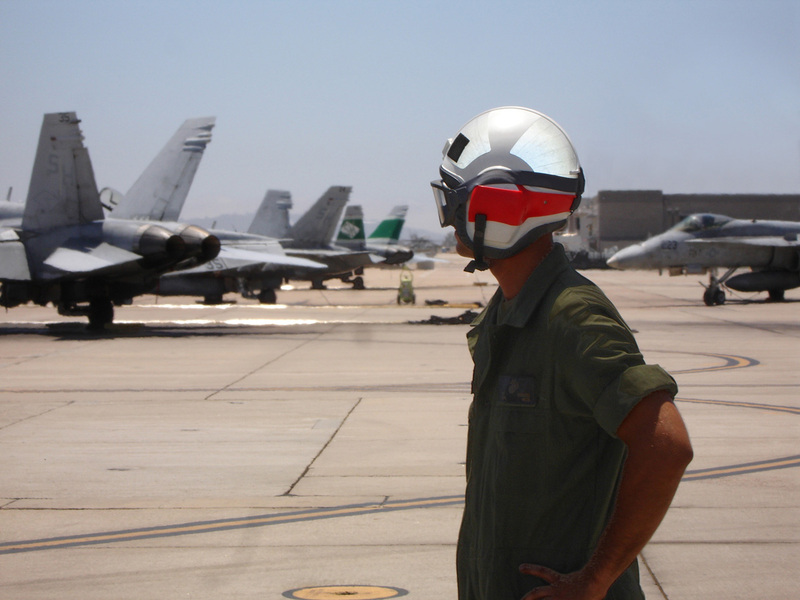 The hearing protection helmet has been tested in the field at Naval and Marine Corps Air Stations (Figure 4) and onboard an aircraft carrier. Lessons learned from the development effort and field testing are discussed in the presentation. [Work sponsored by the US Navy and the US Air Force].